Chrysoprase is a form of quartz, apple green in colour. It is believed to improve memory, reduce nervousness and helps one to make sound judgments in emergencies and stressful situations. 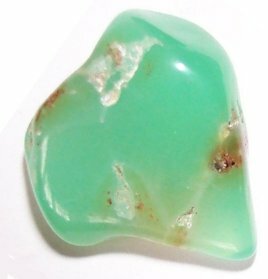 Chrysoprase is an excellent stone for those about to take tests or examinations. It increases insight, stimulates creativity and helps to draw out undiscovered talents. Chrysoprase is reputed to enhance fertility (for both sexes) and to be helpful for gout, eye problems and mental illnesses.